"There is no average reader, and to reach down toward this mythical creature is to deny that each of us is on the way up, is ascending. "It is our belief that no writer can improve his work until he discards the dulcet notion that the reader is feeble-minded, for writing is an act of faith, not a trick of grammar. Ascent is at the heart of the matter." Today's workshop went well, even if it was lightly attended. We looked at sonnets from Shakespeare to Tranter, villanelles, pantoums, Dream Songs, syllabic verse, concrete (typewriter style) poetry, and wrote a healthy amount of the time. One clever lady wrote three very acceptable poems! With a little shining up they'll be blessed with printer's ink before you know it. I continue to be amazed at how people can write in a group, complete strangers, and turn out such creative work. I'm a bit of a loner when it comes to writing. Is this a male trait, do you think? Saturday 31 October 1-5pm, I will be running a Poetry Form Workshop for the FAW(WA) at Tom Collins House. All welcome! We will be approaching the usual forms plus some exotics with examples and exercises. 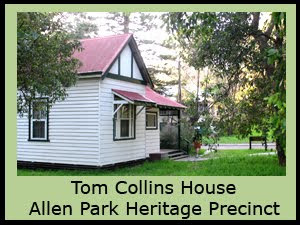 Tom Collins House is in the Allen Park Heritage Precinct, among the trees cnr Kirkwood and Wood Streets, Swanbourne. Perth Poetry Club entertains you with spoken word every Saturday. Enquiries: perthpoetryclub@gmail.com or Janet 0406 624 578. Admonisher of popes and politicians, feisty gladiator in many a social justice campaign, inspirational teacher and devout Catholic nun, Veronica Brady was an intriguing figure on the Australian scene in the latter part of the twentieth century. 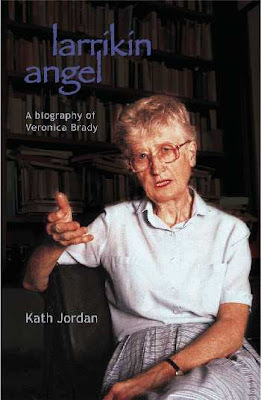 As well as covering her childhood, her decision to enter a religious order, her rise through the ranks of academia and her social activism, this authorised biography discusses Dr Brady’s term on the board of the Australian Broadcasting Corporation, her preparation of the biography of Judith Wright and her travels in China, among many other facets of her very full life. 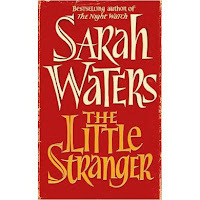 The author has had access to private papers and has spoken to many of her subject’s acquaintances and former colleagues. A splendid tribute to an utterly splendid woman. Veronica Brady's personal combination of activism, spirituality and energetic intelligence is a model of how to be-in-the-world with both rigorous conscience and profound affirmation. Ah, Veronica Brady, my favourite Catholic, the one of whom Pope John Paul II used to ask every morning when he woke up, 'Is she dead yet?' A story worth the telling. Veronica Brady's profound literary sensibility, as well as her vision, moral integrity and fearless truth-speaking, made her the perfect biographer of my mother, Judith Wright. Larrikin Angel gives a fine, vivid sense of Veronica’s own story and shows why she must be considered one of Australia's most precious assets. Veronica Brady's question ‘Do we worship Jesus or an institution?’ captures her value to the Church she served and to all of us. In an often smug and complacent society, we need Veronica Brady and her ilk to remind us to look beyond ourselves. I think Jesus would be OK with her. Please do not neglect to advise us of your address. 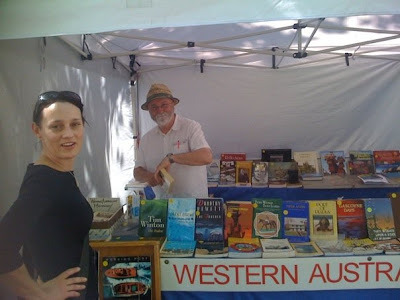 Round House Press is a boutique publishing house located in Fremantle, Western Australia. The press offers inexpensive editorial, design and production services to organisations and individuals to assist them with publishing projects. Contact Allan Watson to discuss your proposal. On the back, Les Murray says: "Lansdown spices the world with pinches of finches." Versatility may not equal woods. Plain speech, once collateral in form. Now tension’s practiced-seeming. In small concentration of attunement fostering an energy induction. Irises, mint, cottonwood. Enough to say the litany reverts to actuality from senses five through seven. Made something to resemble wholeness if perceived as accidental wilderness. Overcome with being filtered through a sentence. I have just finished judging the OOTA (Out Of The Asylum - Fremantle Arts Centre writing group) Spilt Ink Poetry Competition - and I was truly surprised at the consistent high quality of the entries. I have judged many writing competitions over the past three decades, and am used to having an easy time sorting the wheat from the chaff - only the finalists cause real decision making in most competitions. Not this time: I was asked for ten finalists, and my second run through cut it down to 21!! To reduce it further was a test of my evaluating skills. After some hours of soul searching, I reduced it twelve. Then I concentrated on the relationship of form to content - what the poem said and how it said it. Now I have my ten. The top three are still jumping around, but I'm comfortable that I have made an informed judgement. Now, to find out who they are at the celebration (some two weeks away at least). It has been a very satisfying experience, so thank you, Jo, Annie and others on the OOTA team, for entrusting me with this job. And the winners are ... to be announced on the night. Labels: 2009 OOTA Spilt Ink comp. NSW Win Champions Trophy in style! Brett Lee starred with a stunning all-round performance as New South Wales beat Trinidad & Tobago to win the inaugural Champions League Twenty20, and with it a jackpot of US$ 2.5 million, in Hyderabad. The 41-run margin of victory, however, didn't mean it was a one-sided contest: T&T dominated initially, reducing NSW to 83 for 6, before Lee's fighting innings lifted his side to a competitive total. He then returned for a fiery spell with the new ball, jolting T&T's chase with two early wickets. I've just signed up for writing 50 000 words in November at http://www.nanowrimo.org/. Yes, a first draft of a novel in one month. A hell of a lot of people sign up, but I wonder how many people complete it. I wonder if I'll complete it. I've been flashing at false starts for weeks now, so this may get a bulk of words down which I can then shape into something useful. 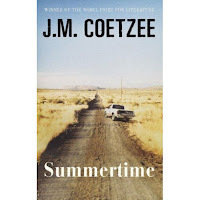 Literary fiction, general fiction, YAL, pulp fiction - who cares. I plan to board my Inner Critic somewhere else for November. Even here, I am editing as I write. So, 50 000 in one month should cure me of that. Gwyneth Lewis, one of Wales’s most distinguished poets, reads a selection of her poetry including some new, unpublished works. 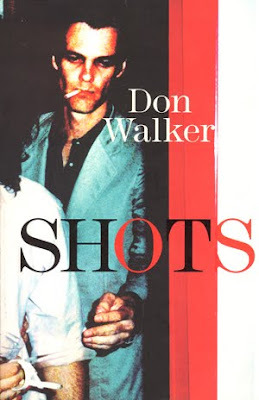 In prose beautifully informed by his long career as one of Australia's best song writers, Don Walker creates a series of snapshots, ranging from his early life in rural Australia to his time as a member of the hugely popular band Cold Chisel. Learning music as a young boy in the bush, the band's early days in Adelaide, wild times on the road, and living on the edge in Kings Cross are all evoked in a pared-back but captivating manner. Fringe Gallery Poetry and Performance Night Sunday October 25th, 7pm till 10pm. Vivienne’s poetry and short stories have appeared in journals (incl. mascara, Colloquy, TEXT, indigo, Blue Dog), anthologies (incl. 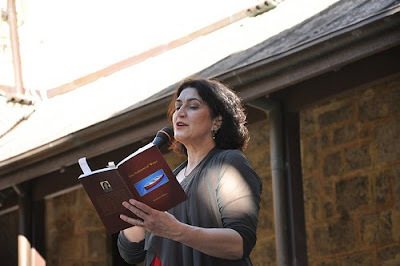 Poetry without Borders, The Weighing of the Heart, Open Boat Barbed Wire Sky) and other publications; she’s won places and commendations in competitions (C J Dennis Literary Award, Spilt Ink, Southern Cross Literary Award, Bauhinia Literary Award). A selection of her work features with 4 other poets in the new anthology ‘Amber Contains the Sun’, published in march this year through the DCA A Few New Words programme. Her first collection ‘The Softness of Water’ is published by Sunline Press. 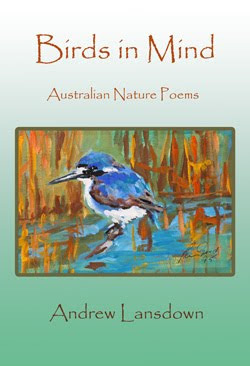 Jean comes from Lake Macquarie, in NSW, she has published three books of poetry: Verandahs ( Anne Elder Prize; Dame Mary Gilmore Award; short listed for the 1991 NSW State Literary Award), Practising Breathing and The Satin Bowerbird ( 1998 Michael Wright Prize). 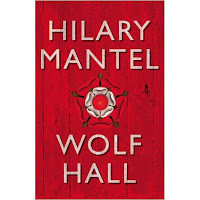 Her most recently completed manuscript, Travelling with the Wrong Phrase Books, was highly commended for the Arts ACT Alec Bolton Prize 2008. 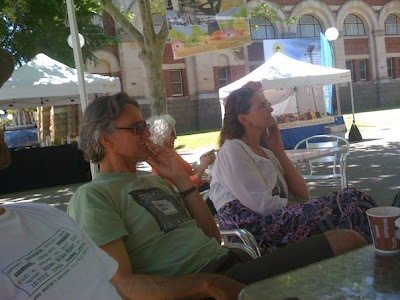 Jean is in Perth as the Established Artist in Residence at the Katherine Susannah Prichard Writer’s Centre. Julie is a member of OOTA and has two poems published in Weighing of the Heart, an OOTA anthology. Julie is a member of the OOTA Friday morning poetry series run by Shane McCauley and has recently become a committee member of OOTA. When: Doors open at 7pm for chat, drinks, open mike sign up. Cost: $5.00 entry. Refreshments can be purchased on the night. 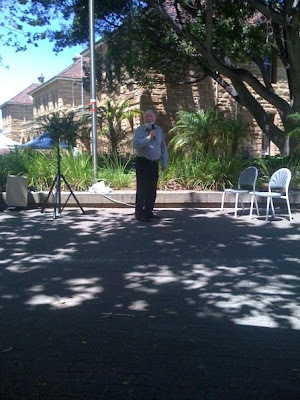 A beautiful spring day in Perth, with a maximum temperature of 37 Celsius, but plenty of shade, saw the inaugural Cultural Centre Markets Poetry Readings. 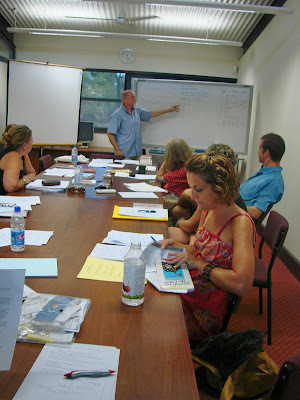 What a lively bunch our WA Poets Inc members are! Chariperson and MC for the afternoon, Peter Jeffery (pictured) rolled up with a microphone and speaker, and poets arrived, bearing books for sale and big smiles. The dark angst ridden poets of bygone eras seem to have faded into the night or the dank corners of cellar bars. Here the sun shone in all its glory, and the words rose to greet the occasion. High-nesting cultural birds provided a chick chorus as Coral Carter got the reading off to a spirited start. I followed, and took the audience on a trip about Western Australia finally landing in China. From my quiet pensive tones to Janet Jackson's performance recital of colourful poems which she projected over PICA and down city streets. The poets followed each other, playing tag, introducing themselves as they went: Sue Clennell (reading from her book The Ink Drinkers), Sally Clark (reading from Poets@KSP, a small anthology hot of the press), Amanda Joy (reading from two USA magazines she has recently appeared in), Rose Van Loon (from Poets@KSP), Brendan Fenton, Jan Napier and his nibs Peter Jeffery. The weather was great for us, in our shadey place, enjoying each poet's performance, but it seems to have discouraged shoppers. I have seen those markets crowded four times larger than today's meagre crowd, but the readings have begun, and we thank the Maidens of the Markets who encouraged such a reading and supplied the power for our humble amp. (Billy Thorpe wouldn't have used it as fold-back >g<)Further outings of a similar kind will be advertised here as dates and performer lists come to hand. All photos by Amanda Joy. For three days starting tomorrow morning, everything at Planet Books is 20% off. Now you can buy 'BEYOND CITY LIMITS' for just $12 (if my maths is right). Buy one for yourself and one for a friend! This sale is only for this Friday, Saturday & Sunday, so get organised and buy your Christmas gifts early at 20% Off. Perth Cultural Centre Markets (between the State Library, the Art Gallery and the Museum). 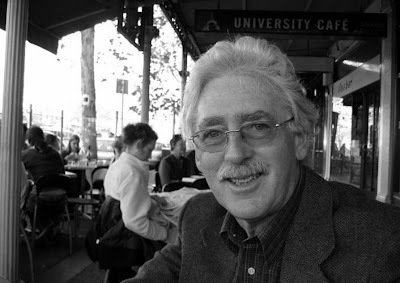 Then you are inited to the Perth Poetry Club for more poetry at the Court Hotel, 2 to 4pm. Fear or a phobia concerning the number 13. Thirteen people, pledged to eliminate triskaidekaphobia, fear of the number 13, today tried to reassure American sufferers by renting a 13 ft plot of land in Brooklyn for 13 cents . . . a month. Past disasters linked to the number 13 hardly help triskaidekaphobics overcome their affliction. The most famous is the Apollo 13 mission, launched on April 11, 1970 (the sum of 4, 11 and 70 equals 85 - which when added together comes to 13), from Pad 39 (three times 13) at 13:13 local time, and struck by an explosion on April 13. Despite NASA's seemingly ingrained case of triskaidekaphobia, which forced managers to impose the bizarre, '13-free' numbering system on its flights, the crew of perhaps the most important Shuttle mission to date clearly were unsure if STS-41C was supposed to be unlucky or not. Triskaidekaphobia is from Greek treiskaideka, triskaideka, thirteen (treis, three + kai, and + deka, ten) + phobos, fear. Poets will be making some noise at the Perth Cultural Centre Markets! 1000 Verse Renga, the world's longest poem ever! 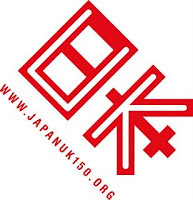 I'm the Embassy of Japan's roving "Japan-UK 150" haiku & renga poet-in-residence at Bath Central Library's poet-in-residence for October (into November) starting with National Poetry Day this Thursday at 2pm. within an inch of their binding. into jigsaw pieces over my study floor. I’ll clean that up when we get home. the sky, yearning for longevity. My dog and I step carefully. create, one lip singing over another. The 'Pies are out of the finals. but it won't fly off. and his head and his heart is an artist." 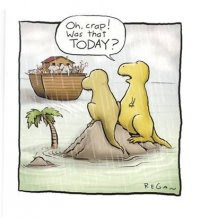 I hitched this from Amanda Joy's facebook page. Thanks, Amanda, I think it is great.